Shawn “Jay-Z” Carter and Will & Jada Pinkett Smith have enthusiastically joined the producing team of Fela!, the new Broadway musical based on the life and music of African composer and performer Fela Anikulapo-Kuti, marking the first Broadway production that these entertainment icons have presented. The critically acclaimed musical, which played to sold-out crowds dancing in the aisles during its world premiere last summer at Off-Broadway’s 37 Arts, arrived on Broadway at the Eugene O’Neill Theatre (230 West 49th Street) on Monday, October 19. The official opening is was on Monday, November 23. Fela! is directed and choreographed by Tony® Award-winner Bill T. Jones (Spring Awakening), with a book by Jim Lewis and Bill T. Jones. Fela Ransome Kuti was born in Abeokuta, Nigeria, north of Lagos in 1938. His father was a Christian schoolmaster, minister and master pianist and his mother was a world-recognized feminist leader, who was very active in the anti-colonial Nigerian women's movement during the struggle for independence. Fela was educated in Nigeria amongst the indigenous elite. Ironically, many of his classmates in his Nigerian school would become the very military leaders he so vociferously opposed. With medical aspirations for their offspring (Fela’s older brother. Koye, was to become a Deputy Director of the World Health Organization and his younger brother, Beko, President of the Nigerian Medical Association) in 1958 Fela's parents sent him to London for a medical education. Instead, he registered at Trinity College's school of music where he studied composition and chose the trumpet as his instrument. Quickly tiring of European composers, Fela, struck by Miles Davis and Frank Sinatra, formed the Koola Lobitos in 1961, and his band became a fixture in London's club scene. Two years later, Fela returned to Nigeria, restarted the Koola Lobitos, and became influenced by James Brown. Trying to find an authentic musical voice, he added elements of traditional Yoruba, high life and jazz, and "Afrobeat" was born. In 1969, Fela's Koola Lobitos traveled to Los Angeles to tour and record. During his eight months in the US, with LA as a home base, Fela befriended Sandra Isidore, who introduced him to the writings and politics of Malcolm X, Eldridge Cleaver and other proponents of Black nationalism and Afrocentrism. With this new politically explicit and critical worldview, Fela reformed the Koola Lobitos as Nigeria 70 and returned to Lagos. He founded a commune/recording studio called the Kalakuta Republic, complete with his own private nightclub, The Shrine, and Fela dropped his given middle name "Ransome," and replaced it with a Yoruba name "Anikulapo" (meaning "he who carries death in his pouch"). Playing constantly and recording at a ferocious pace, Fela and band (who were now called Africa 70) became huge stars in West Africa and beyond. His music served as a rallying cry for the disenfranchised, critiquing the military government, and made Fela not only a pop star but thrust him into political life. People took to the streets singing his songs and the military responded by viciously harassing Fela, jailing him and nearly killing him on several occasions. In 1977, during a government-sanctioned attack on his Kalakuta Republic commune, Fela and other members of his commune were arrested; Fela himself suffered a fractured skull as well as other broken bones; a number of women living at Kalakuta were beaten and raped; and his 82-year old mother was thrown from an upstairs window, inflicting injuries that would later prove fatal. The soldiers set fire to the compound and prevented fire fighters from reaching the area. Fela's recording studio, all his master tapes and musical instruments and the only known copy of his self-financed film Black President were destroyed. After the Kalakuta tragedy, Fela briefly lived in exile in Ghana, returning to Nigeria in 1978. A year later, he formed his own political party, MOP (Movement of the People) and ran for president in two elections, although his campaigning was consistently blocked by the military. As the '80s ended, Fela recorded blistering attacks against Nigeria's corrupt military government. Fela Anikulapo-Kuti was arrested more than two hundred times in his life, and charged with almost every conceivable crime, although only serving one eighteen month sentence in jail for a currency violation. Despite this constant harassment he continued to live in Nigeria even though, as an icon in the international world of rock and roll, soul, jazz and hip-hop, he could have at any point abandoned Nigeria and led the life of an international music superstar. His death on August 3, 1997 of complications from AIDS deeply affected musicians and fans internationally, as a unique and ineffable musical and sociopolitical voice was lost. In Nigeria one million people attended his funeral. His incredible body of work, almost 70 albums, is now available, through public demand, all over the world. Since 1995, multiple Grammy and award winner, Shawn “JAY-Z” Carter has dominated the rap industry and set trends for a generation. Now in 2009, he personifies the “American Dream." Founder and chairman of Rocawear, he is also co-owner of the NJ Nets, 40/40 sports clubs, Translation Advertising and Carol’s Daughter skin line, as well as a partnership with Iconix Brand Group. After three successful years as President and CEO of Def Jam Recordings, where he fostered the careers of international stars Rihanna, Ne-Yo and Kanye West, JAY-Z entered into a partnership with Live Nation to form Roc Nation. Through Roc Nation, JAY-Z released the Blueprint 3, his 11th #1 album, putting him ahead of Elvis for most #1 albums by a solo artist. He continues his philanthropic work through his Water For Life initiative and the Shawn Carter Scholarship Foundation. Two-time Academy Award nominee Will Smith has enjoyed unprecedented success in a career encompassing films, television, and multi-platinum records. For his memorable portrayal of Muhammad Ali in Michael Mann's Ali, he received his first Academy Award nomination and that was followed by his second nomination for the true-life drama, The Pursuit of Happyness. Films in which Smith has acted include I Am Legend, Hancock, I Robot, Independence Day, Men in Black and Men in Black II. Films in which Smith acted and also produced along with partner James Lassiter at Overbrook Entertainment include Hitch, ATL, The Pursuit of Happyness, Seven Pounds and The Human Contract. Jada Pinkett Smith stars as Christina Hawthorne in TNT's newest medical drama "HawthoRNe." The show, which Jada executive produces through her production company 100% Womon, garnered critical acclaim for its first season. The second season will air in the summer of 2010. Recent films in which Jada has acted include Madagascar: Escape 2 Africa (as the voice of Gloria), The Women, Reign Over Me, Matrix Reloaded and Matrix Revolutions. Jada wrote and directed The Human Contract and served as executive producer of The Secret Life of Bees. Additionally, Jada's 2005 children's book “Girls Hold Up This World” was a New York Times bestseller. In this new musical, directed and choreographed by Tony® Award-winner Bill T. Jones with a book by Jim Lewis, audiences are welcomed into the extravagant, decadent and rebellious world of Afrobeat legend Fela Anikulapo-Kuti. Using his pioneering music (a blend of jazz, funk and African rhythm and harmonies), Fela! explores Kuti's controversial life as artist, political activist and revolutionary musician. 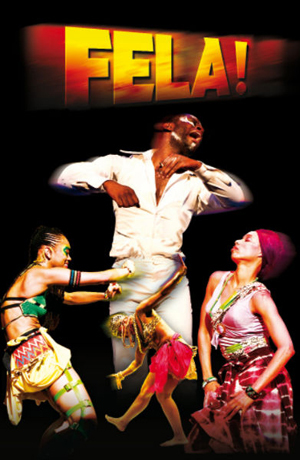 Featuring many of Fela Kuti's most captivating songs and Bill T. Jones’s imaginative staging, Fela! is a provocative hybrid of concert, dance and musical theater. Bill T. Jones (Conceiver/Director/Choreographer/Book Writer) is the recipient of a 2007 Tony® Award, 2007 Obie Award, and 2006 Stage Directors and Choreographers Foundation CALLAWAY Award for his choreography for Spring Awakening; the 2007 USA Eileen Harris Norton Fellowship; the 2006 Lucille Lortel Award for Outstanding Choreography for The Seven; the 2005 Wexner Prize; the 2005 Samuel H. Scripps American Dance Festival Award for Lifetime Achievement; the Harlem Renaissance Award; the 2003 Dorothy and Lillian Gish Prize; and the 1994 MacArthur “Genius” Award. In 2000, The Dance Heritage Coalition named Mr. Jones “An Irreplaceable Dance Treasure.” Mr. Jones choreographed and performed worldwide with his late partner, Arnie Zane, before forming the Bill T. Jones/Arnie Zane Dance Company in 1982. He has created more than 100 works for his company. Jin Lewis (Conceiver/Book Writer/Additional Lyrics) In 2008, Jim received a Lortell for “Outstanding Musical” for FELA! and two Drama Desk nominations for “Best Book” for both FELA! and This Beautiful City (w/ The Civilians). Selected works. B’WAY: Chronicle of a Death Foretold (TONY, Drama Desk nominations); and Dangerous Games (both w/ Graciela Daniele). OFF B’WAY/REGIONAL: Tango Apaisionado; Ionesco’s The Chairs; Ibsen’s Lady from the Sea. OPERA/DANCE: Paul Dresher’s The Tyrant; Ballet Hispanico’s Nightclub; Philip Glass' Les Enfants Terribles ; PastFORWARD (w/ Mikhail Baryshnikov). DRAMATURG: House Arrest (Anna Deavere Smith); Drawn to Death (Art Spiegelman); Cymbeline and Waste (w/ Bartlett Sher); Lincoln Center's WOZA AFRIKA Festival. Previously w/ Bill T. Jones: Dream On Monkey Mountain, Chapel/Chapter, and Still/Here (20th Anniversary Season). ANTIBALAS (Arrangements / Musicians). Credited with introducing Afrobeat to a new generation, this Brooklyn-based collective has released four critically acclaimed albums since forming in 1998, and can been heard on numerous Afrobeat compilations. Antibalas has performed more than 700 concerts around the world including appearances at the Coachella, Newport and the Montreux Festivals.